The Highgate Fencing Club is a foil fencing club based in North London (Brookfield School, Chester Road, London N19 5DH). It is affiliated to the British Fencing Association and runs an early Monday evening fencing session for juniors and a Monday evening session for adult fencers. Junior fencing for children from age 12+ caters for all abilities. Sessions include both group lessons and one to one lessons from the coaches, together with organised fencing bouts between children. All the fencing equipment they need is supplied, although children would need to wear a Tee shirt, tracksuit and trainers. Adult (from age 15+) fencing sessions are for beginners/novices, intermediates and advanced foil fencers. Please contact us for a trial session where we will be delighted to introduce you to the club. 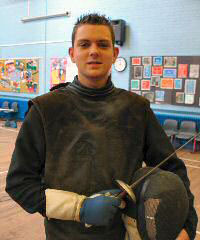 The Highgate Fencing Club is situated in Brookfield School, Chester Road, London N19 5DH. The entrance is on Croftdown Road, around the corner from the Chester Road main entrance. Please use the buzzer. If no one is there to let you in, please call Tony Coton on his mobile. By train: The nearest London Underground stations are Tufnell Park and Kentish Town, (Northern Line). The nearest train station is Gospel Oak (Silverlink). By bus: There is a bus stop outside of the school for busses 214, C2 and C11. The Club runs courses on Mondays in term time throughout the year for both juniors and adults of all standards. Junior and Cadet (aged 12-14): 7-8pm. Adult: 7-9pm. For full details and dates of the next course for both juniors and adults please COURSE DATES & PRICES above or call Tony Coton on: 0208 640 4702 or on his mobile: 0793 05754 81. The Highgate Fencing Club is proud to have a coaching staff that have both coached and competed at the highest level. Tony Coton has coached professionally for over 30 years at all levels (junior, beginner, intermediate & advanced) with all three weapons (foil, epee & sabre). 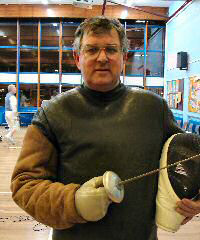 Tony coaches at many other clubs including Salle Coton and Streatham Fencing Club. Tony also teaches fencing at many local schools including Putney High School in Wandsworth and Ursuline School in Wimbledon. Chris Coton is assistant coach to Tony, accompanying him to all the schools and fencing clubs where his father currently teaches. He has already competed both at national and international A-grade level and brings a youthful and energetic enthusiasm to his lessons. Chris has recently achieved the Instructors Level 1 ,2 and Level 3 Qualifications from British Academy of Fencing.